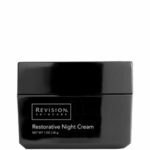 Restorative Night Cream for a hydrating treatment for all skin types. Contains a powerful peptide and vitamins to help tone skin. Softens and moisturizes skin with Jojoba Seed Oil. Brightens skin with marine-derived Algae Extract.